There's a wet spot on your ceiling that keeps getting bigger and bigger! You've clearly got a water leak. But wait a minute...there's no bathroom, kitchen or other water source above that spot. Hmmm you've got a plumbing mystery on your hands. Time to call The Plumbinator, the expert in solving plumbing mysteries without tearing up your house. When you've got a mystery leak, you need to find the leaking pipe and fix it, ASAP, before it starts to damage your house or form black mold that can harm your health. So, you call a discount plumber and he can't figure it out either, but wants to start hacking open your walls in different places, or digging holes all over your yard, or worse, busting out the concrete under your carpet on an exploratory mission that may result in nothing except an expensive, ruined house and yard! We get called to houses all the time where the plumber charged an arm and a leg, ripped up the walls or ceiling and never even found the leak. Or maybe they did manage to find the leak, but didn't want to mess with fixing it. Now you're left hanging, forcing you to do more research and make more phone calls to find a plumber who has time and expertise to come fix your leak quickly. Advantage #1: We Find it AND Fix It! We are a one-stop shop for expert leak location and repair. What should you do if you have a mystery leak? Step 1: Make an appointment for us to bring our high-tech equipment out to pinpoint the source of the leak by calling 512-786-1771. Leak location costs $400 for the first 90 minutes and $150 per hour after that. We find 95% of leaks within the first 90 minutes. Step 3: If you accept the price on the estimate, sometimes the leak can be fixed that day, other times we will set up an appointment with you to come back in a day or two to fix it. If you do not accept the price on the estimate, you will only pay for the leak detection, and we'll be on our way. We are leak location specialists! So we have purchased expensive, specialized equipment and spent days in training with an instructor to learn to expertly pinpoint the source of your leak. Generalist plumbers don't have this training or equipment. This allows us to find the leak without hacking holes in your wall or ceiling or digging up your yard on a fact finding mission. How does the equipment work? The water flowing out of a leak in a pipe causes the pipe to vibrate. These vibrations are transmitted throughout the line and can be picked up, even at distant contact points such as toilets or fittings. The vibrations are also transmitted up through the ground to the surface, although the sound is very muted. Our sophisticated listening equipment makes the vibrations of the leak audible to the human ear through our specialized headphones. If the electro-acoustic equipment can't pinpoint the leak to a small enough area, we get out the big guns - the helium sniffer! 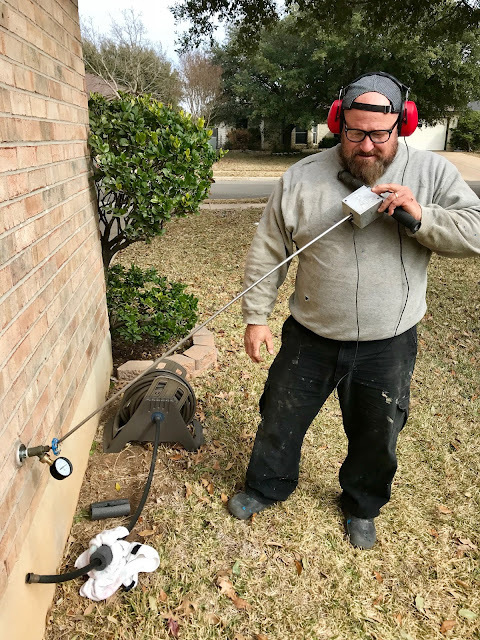 At the hose bib, we inject helium, an inert gas, into the line and when the helium escapes through the leak, our high-tech helium "sniffer" will sniff out the exact location! 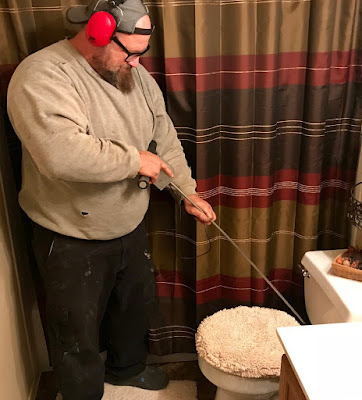 Advantage #3: Minimally Invasive "Keyhole Surgery"
Once we find the leak, we can then perform minimally invasive "keyhole surgery" on your plumbing to minimize damage to your house and yard. Here, Mickey is performing keyhole surgery on a driveway to fix a yard leak. 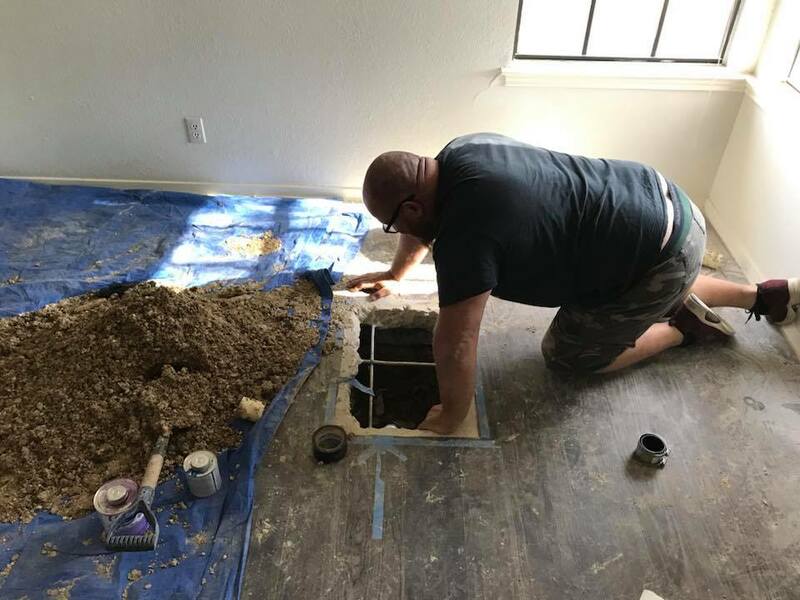 Here, he was able to only make a small hole in a floor to fix a sewage leak, all thanks to high-tech leak detection!